I read through the Fram vs Napa comparrison and think I have my question answered but would like verification. I don't know what year my L20B is. Does it matter what filter I run on it? A Napa 1521 or Napa 1452. As long as it is not too tall for my application I'm good? It has a 1521 on it now. The guy gave me a 1452 before I knew I had a 1521. Do not use Fram if you care about your L motor. NAPA are ok. I believe the old Ford 4.9 liter (300cu in) inline six will also work. I've used 305 chevy filters too I think. Just compare the position of the rubber gasket on the bottom are the same. These are at least as big if not bigger and usually cheaper. Always check the block surface and make sure the old rubber gasket didn't stick to it from the old filter. Wipe some oil on the new filter gasket and hand tighten. Start and always check for leaking. I use the traditional "Ford" filter, as datzenmike says. NAPA 1515 or Wix 51515. HRH here on Ratsun first told me this would fit an L20b (Thanks, Matt!). This size is slightly taller than the original size filter, but there should be room on most Datsuns for it to fit. Taller size should mean a little more filter area, and they are usually somewhat cheaper than the original size filter. Yup, 1515 is what HRH recommended in the other thread. I've used it every oil change since. Average cost is about $7. I keep a spare one on hand at all times. Big blue one from the dealer for me. But I also only pay like $3 a piece for it. I always have to check the book. Actually I think I have it in my phone as a note. 1515 Ford V8 filter fits 90% of Ford V8s, and 90% of Datsuns. You only need to use the 1521 if you need a shorter filter. As in to clear a frame rail. 1452 is the exact same as a 1515 if I recall correctly, but they charge you twice as much. Actually thinking of an oil change this weekend for the sedan. So which was the cheaper Matt??? 1515 is the cheapest due to being Ford V8 filter. Conveniently fits a slew of other vehicles, including Datsun. If you're in Spokane, we're having our filter sale for the corporate stores Sept 4th-21st. That includes Post Falls, ID. Don't know about NAPA Canada. I use Motorcraft FL1As because I can get them by the case at dealer cost (my Uncle is a Ford parts manager). The Motorcraft filter is just a specialty Purolator most of the time anyway. But, when I don't have any I use the good old Wix/NAPA #1515. I bought 2 cases of Napa 1515's before I moved out here, paid 1.97 a piece for them during a filter sale. Damn good filters. Thanks for all of the replys and info! This is exactly what I needed to know! Thank you! Thanks guys, I went to NAPA today and got the Ford 4.9 liter inline six filter and some oil. Go to Wix's site, and check the 51515 page. The list of vehicles that filter is used on is huge! It seems that almost every manufacturer has used it at some point. I also used Wix's site to compare the 51515 (1515), and the 1452, and they are identical spec wise. Here is the difference in size. The smaller one is from Canadian Tire a local Canadian auto store and other crap. This is from my 710 sedan L18 and came with it on. The oil was spotless clean so I'm just now changing it because of all the short trips to work by Mrs.D this summer. They are made by Fram and this one's likely NOT from China as it is still printed with red... all the new ones are made in China and have black lettering. Can you imagine Fram..... AND made in China??? Could it get worse??? I've never had problems with Can Tire (or crap tire as we like to call it) oil filters but I also change more often than needed. Once I found they were really Fram filters I stopped buying them. 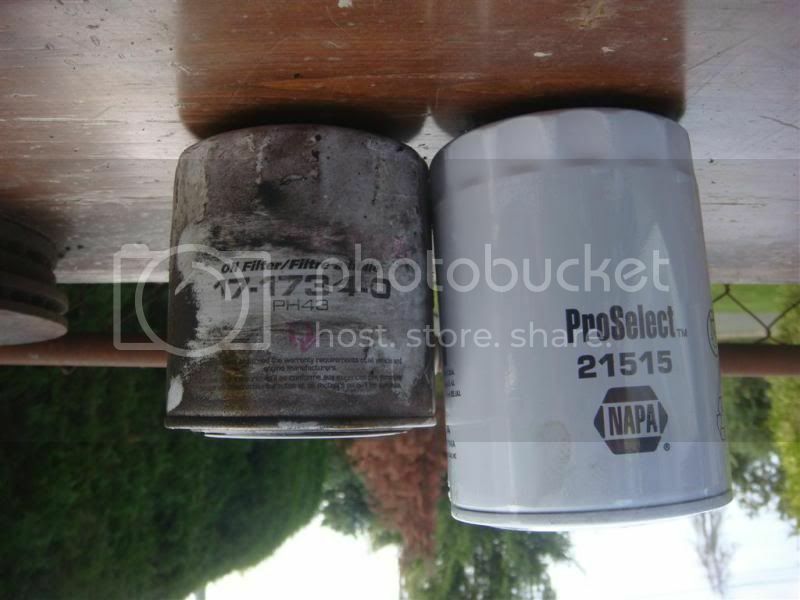 Now, unbelievably, there is an even better reason to not go down the oil filter aisle. No Lordco filter then, eh? We have Lordco but friggin expen$$ive. I never go there. Lots of name brands that have never been heard off.... outside China.